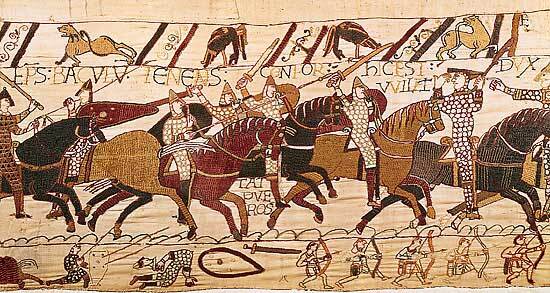 The Tapestry depicts the events leading up to the Norman conquest of England culminating in the Battle of Hastings. It consists of fifty scenes with Latin captions, embroidered on linen with coloured woollen yarns. Its origins have been the subject of much controversy. The skills of the embroiderers were, according to Mrs Makin, on a par with professional embroiderers of today. The embroidered cloth was not woven and so is not technically a tapestry. The couch, stem, split and chain stitches found in the tapestry can still be used by embroiderers today, though according to the researcher, the level of accuracy of the medieval craftsmen and women achieved is an amazing feat. Mrs Makin added: “The achievement of these people is quite remarkable when you consider the conditions they worked in. They would have almost certainly worked in daylight hours only, using basic equipment – such as shears to cut the cloth – with little formal training as we know it today, on what was a massive project even by today’s standards. 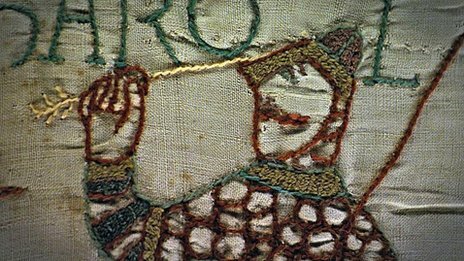 Sylvette Lemagnen, Curator of the Bayeux Tapestry, said: “I am delighted with this study, which I believe to be fundamental to the understanding of the Bayeux Tapestry. I have always been convinced that historians would benefit from establishing a dialogue with specialist embroiderers and Alexandra Makin has that rare quality of being expert in both fields. See also Who was the mysterious Ælfgyva in the Bayeux Tapestry?